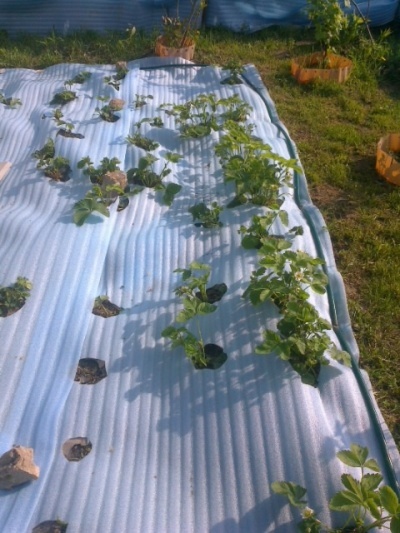 Want almost never loosen the soil around the strawberry plants, it is very rare to watering and weeding it, but instead to harvest the sweet berries for 2 weeks early? It is not a utopia but a reality. Help this bed that looks nice and original. Unique author's development – at your service! Since the end of August and all of September in the middle belt are planting strawberries. In one place it grows for 4 years. Of course, during this time, a cultivated plant trying to attack the ubiquitous weeds. You have to constantly fight with them to give them the opportunity to grow berry bushes. But it's all in the past. Growing up in the valley, strawberries tend to get wet during winter thaws and during spring floods. If you have a site, you need to make a ridge. The place should be Sunny, as in partial shade berries will be sour. The ridge may have a width of 30 or 60 cm In the first case, the strawberries, planted in the autumn, will grow in 1, and the second in 2 rows. If the land plot is heavy, be sure to add on a bed of peat or sand. In any case, compost or humus is required. As such the power of this culture loves. If you have a bit of decomposed organic matter, you can add it directly in the hole. When the ridge is cut, take the tar paper or black tape. These materials prevent the penetration of light, and the weeds just won't be able to straighten up, to grow. Under such shelters moisture is retained longer, so you will need to water the strawberries very rare. For greater strength the foil is better folded in 2 times. Cut holes in it with a diameter of 8-10 cm – a pleasure. The roofing material is better to do it with a knife that do not mind dirty. The distance between the holes 35, see If you have a two-row bed, cut out circles in a checkerboard pattern. 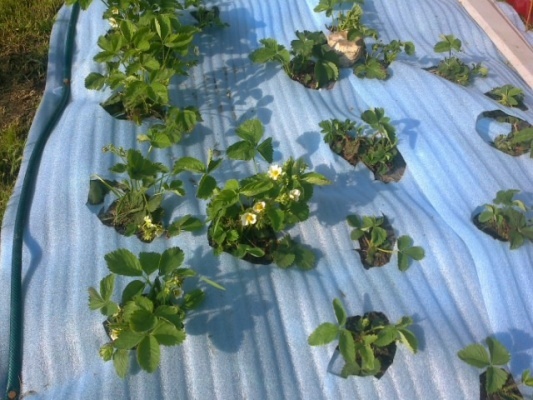 To planting strawberries looked amazing, spread on the grass blue substrate, which is used for the laminate. Top off with roofing material or film and make the same holes in this beautiful material. Lay the workpiece on the bed in the reverse order: lower film or roofing material – top – substrate. All is well fastened to the ground, put on the perimeter of the old rubber hose for watering, nail large nails through the substrate, the roofing material to the soil. If you do not have such unnecessary country inventory can cut out the old linoleum squares with sides 5 cm and nail with them. In the course of going thin rubber galoshes or narrow boards, slats. Now dig each cut circle of deepening spatula, spoon into the wells in 0.5 teaspoon special fertilizer for strawberries. If you do not make humus, add it at this stage directly in the notches. The soil is mixed with a spatula, the water is poured out and planted strawberry mustache. The roots should be covered with soil, and the growing point should be at ground level. So is planting strawberries in the fall and late summer. In the spring, when thawed soil, the bushes will start to develop actively and will bloom 2 weeks earlier than their counterparts that were planted in regular beds. So you can feel the flavor of strawberries and taste the first juicy berries earlier than the neighbors!